i get pretty lots of comment saying i look young or i have good skin. hmm… actually it takes just a little bit of effort to make my skin looks good. 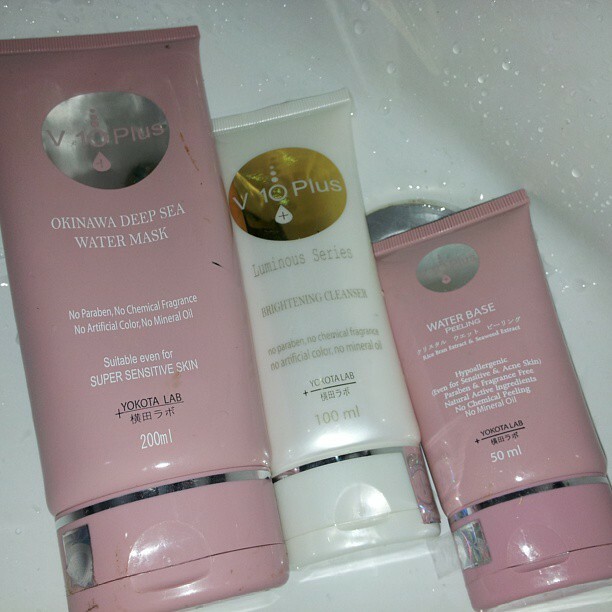 They are my favourite combo to prepare my skin before i sleep v10plus water base peeling, followed by brightening cleanser and my favourite Okinawa Deep Sea Sleeping Mask. This gentle peeling contains rice bran extract & seaweed extract. Without any harsh scrubbing, it effectively removes dead skin cells and reveals a cleaner & clearer skin instantly. i love how it remove my dead skin without leaving scratches on my skin. it is very gentle for my skin. my skin looks brighter after use. also, it is a gentle peeling so it is suitable to use daily. Brightening gel cleanser that helps to cleanse impurities thoroughly without ripping off the skin’s natural moisture film. It contains magnesium ascorbyl phosphate to brighten dull-looking skin caused by external environmental pollution while aloe barbadensis leaf extract and rice bran extract help to improve skin barrier function and moisturise the skin to keep it clean, smooth and supple. it does look a little pricey for a mask however, i wouldnt complain when i use it. i find myself completely hooked to it. it has a natural cooling sensation and whenever i have bumps, redness, breakouts, it helps to soothe off pretty fast. i really hate itchy pimples . V10 Plus Okinawa Deep sea Mask helps to calm itchy pimples and helps to make it subside. it works for me well.